The cushion cut diamond is one of the most timeless and classic diamond shapes. Some of the world's most renowned diamonds are cushion cut. Our Cushion Cut collection of engagement rings are designed with one thing in mind: to complement the diamond's rounded corners and large facets to further enhance the diamond's brilliance. Our popular collection of uniquely handcrafted halo and solitaire cushion cut engagement ring designs are designed and handmade in the United States. What Makes a Cushion Cut? An engagement ring is set with a cushion-cut gemstone if it sports a squarish gemstone with rounded corners. In other words, it's in the shape of a cushion. The bright facets of the cushion-cut gem give it a modern look, but it's actually been around since the 19th century. Indeed, most gemstones of that era were cushion cut until the cut was surpassed by the brilliant cut, which is a bit more fiery and radiant. Some of the most famous gemstones are cushion cut, including the Logan sapphire and the yellow Tiffany diamond. A traditional cushion-cut gem has 64 facets and an open culet, which is the facet at the very bottom of the stone. The round corners add depth and emphasize the gem's luster as opposed to its brilliance. More modern cushion cuts can have interesting faceting, including checkerboard and Portuguese facets. The Portuguese facet has three rows of rhomboidal facets and two rows of triangle-shaped facets above the girdle of the gem and four rows of rhomboidal facets and a row of triangle-shaped facets below the girdle. Advanced technology has allowed even more interesting faceting when it comes to the cushion cut. Who Should Choose a Cushion Cut Engagement Ring? Almost any bride-to-be would be pleased with the look and sparkle of a cushion-cut engagement ring. This is a diamond style that looks good in a variety of settings and metal colors. Does an engagement ring with a pop of color appeal to you? The cushion-cut gemstone is ideal for colored gemstones, because the deep facets bring out the color. Although regular white diamonds look gorgeous in a cushion cut, this cut is also ideal for a ring that doesn't feature the traditional white diamond. Gems that look good in a cushion cut include rubies, spinels, emeralds, sapphires, tanzanite, morganite, aquamarines and colored diamonds, or "fancies." They are especially attractive in a halo design where they're surrounded by smaller gemstones. Small, brilliant-cut white diamonds go well with colored, cushion-cut jewels. 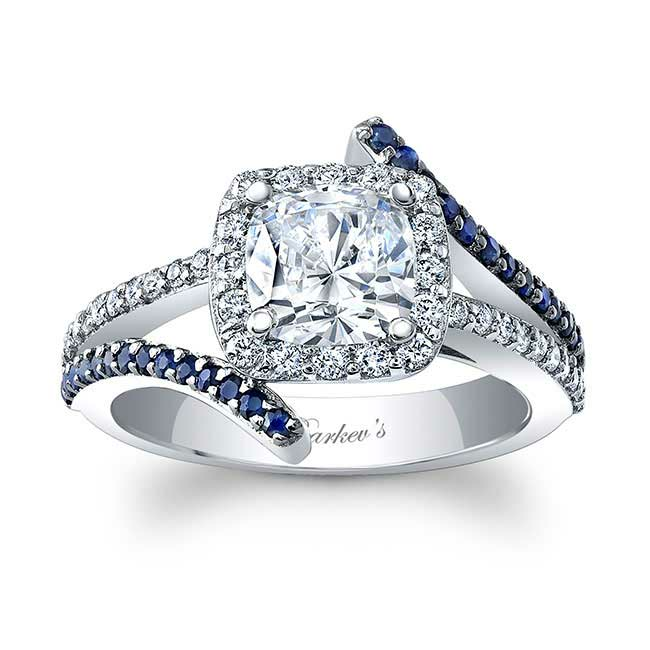 Some rings have a three stone setting with the large, central cushion-cut gem flanked by two smaller gems. The two smaller gems can be different gems of different colors, cuts and sizes if the bride wants to be a bit daring. Depending on its color, a cushion-cut gem goes well with different types of bands, including rose gold, white gold and yellow gold. These gems also enhance bands made of platinum. The bands can be simple or adorned with smaller gemstones in channel settings. They can be placed in clusters on the shoulders of the band beside the central gemstone or set all around the band. The shank can also be elegantly twisted, braided or split. These twists, braids and splits are sometimes encrusted with smaller jewels. 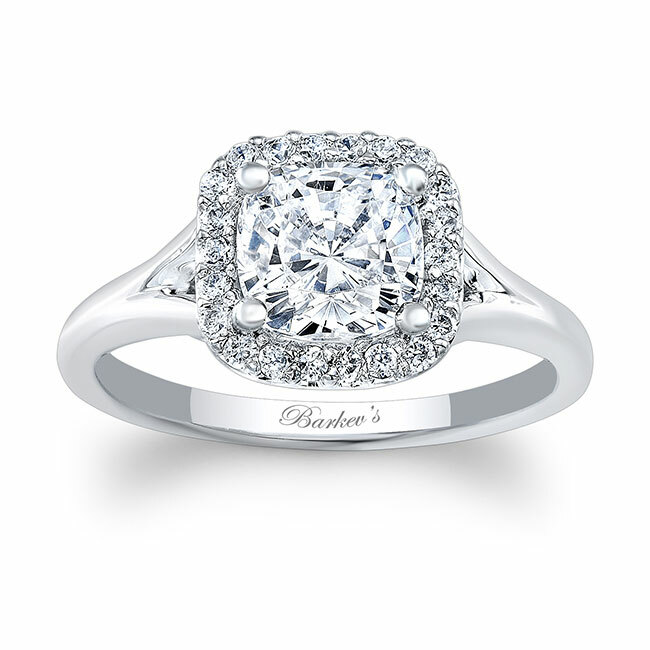 Shop with Barkev’s today for the best selection of cushion-cut diamond engagement rings!